I've been following this project Wave to Wave is doing, restoring an old 22 Activator. Always liked the small outboards. They have a couple episodes so far. Episode 3 is coming this week, we talk about materials and some ideas with the boat. Subscribe on YouTube if you can. The hull is getting ready. Here was episode 2, about engine choices if you missed it. Episode 3 is up. Getting to work soon on ep. 4. Will be talking about the transom, possible colors and ideas. Subscribe on YouTube. Episode 4 is up. We talk about paint and design. One little modification to the transom well that we will do. Next episode will go to the shop and look at the transom and stringer install. Subscribe and follow along on YouTube. I like the idea of the project. But would like to see the actual work being performed. Would help educate people on the correct way to do the work. Just My 2c. Ya, I agree. We appreciate the feedback too. This week there was a little delay in getting some materials, so I thought I'd do this episode to fill the space, but next week and following we will be more in the shop with hands on stuff. Episode 5 is coming soon. Things are moving along, transom is in, stringers glassed in. Last edited by WavetoWave; 04-30-2018 at 01:24 PM. Episode 5 is up, In this episode we move things to the shop, where we look at the transom and stringer install. 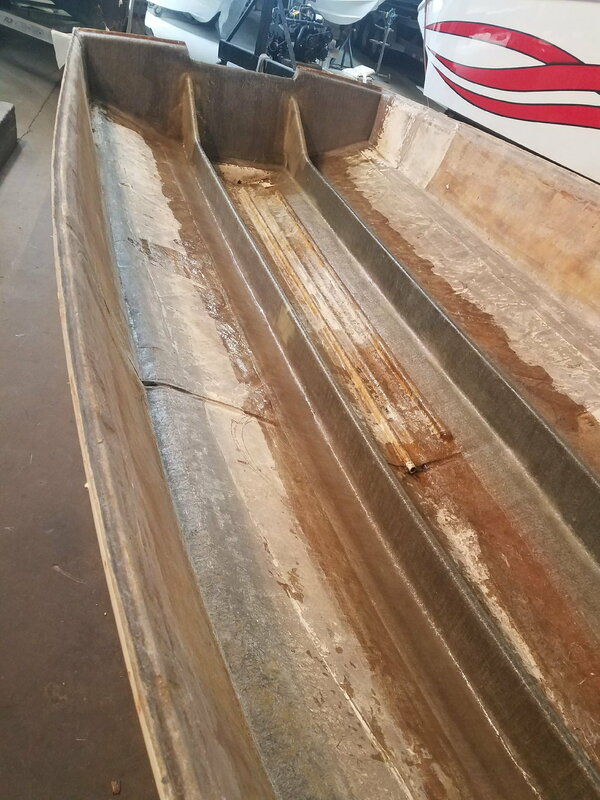 We talk about how the stringers were formed to fit perfectly to the hull, bonded in place, and we used 2408 fiberglass to glass everything in. The resin used is a proprietary resin Mark at Rage Powerboats likes to use. We also discuss the fuel tank plans and putting in the reinforcing tabs. Last edited by WavetoWave; 05-07-2018 at 05:21 PM. Here's a few shots of the process not in the video. I was out of town while Mark was doing some of it.